World Hearing Day is celebrated annually on the 3rd of March. This World Health Organisation initiative aims to create awareness about the importance of one’s ears and hearing. Events take place all over the world, all based around a theme. The theme for 2019 is ‘Check your Hearing’. Why this theme? Audiologists all over the world know the importance of early identification of hearing loss. It is common knowledge that early identification and intervention is required for children with hearing loss, but many people do not realize that it is as important for adults, and those who develop hearing loss later in life. The longer hearing loss is left undiagnosed and untreated, the fewer management options exist, and the harder it is to adjust and adapt to things like hearing aids. This is why the World Health Organisation recommends that all people should check their hearing regularly, especially once over the age of 50. 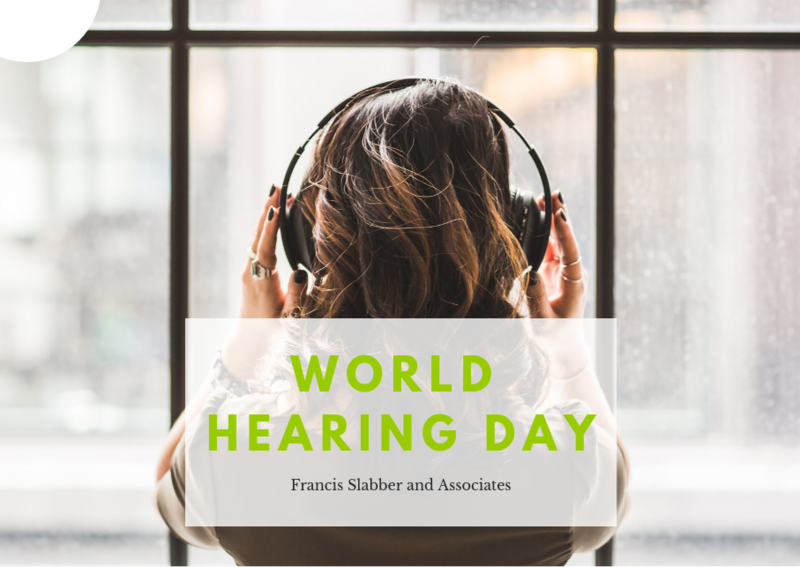 To celebrate World Hearing Day 2019, Francis Slabber and Associates invites you to ‘Check your Hearing’- and we have a number of ways for you to do it. On the 28th of February 2019, our Wynberg and Fish Hoek rooms will be open for hearing screenings with our audiologists at no charge- contact us to book your space. You can also complete a free online hearing screening on our website (click here). Remember, a hearing screening is not the same as a full diagnostic assessment. It does not tell us the extent of hearing loss, or give us the basis for management, but it does help to identify whether a possible loss exists, and can help us to send you in the right direction for help. If you have hearing loss that is already diagnosed, or if you wear hearing aids, it would be better to book a full diagnostic hearing assessment to get more information about your hearing. World Hearing Day is the perfect opportunity to invite any family or friends who have been putting off a hearing test. Encourage those around you to Check their Hearing in order to identify any hearing loss early. If you would like to visit us on the 28th of February 2019 for a hearing screening to celebrate World Hearing Day, or if you would like more information, please contact us at 021 797 7948 or audiology@francisslabber.co.za.